Phineas Taylor Barnum (Ellis Rubin, Hugh Jackman) grew up poor as the son of a tailor. While working for the wealthy Hallett family, Phineas meets their daughter Charity (Skylar Dunn, Michelle Williams). Despite the difference in their lifestyles, Phineas and Charity quickly become inseparable. Phineas promises Charity the world. He only has to find a way to deliver it. After they are married, Phineas and Charity have two daughters, Caroline (Austyn Johnson) and Helen (Cameron Seely). They struggle to make ends meet, but they provide the best life they can for their daughters, and all of them are happy. When Phineas loses his job, he comes up with a creative plan to make his fortune. After convincing a bank to lend him money, Phineas buys Barnum’s American Museum. As a museum, it isn’t bringing in customers. Phineas gets the idea to hire people who are “unique” including Lettie Lutz (Keala Settle), a bearded woman with a beautiful voice, a little person dubbed Tom Thumb (Sam Humphrey), acrobats (Zendaya, Yahya Abdul-Mateen II), and many others. Sales pick up but they are still barely surviving until James Bennett (Paul Sparks), a theater critic, pans the “freak show” calling it a circus. Phineas thrives on the negative attention, renaming the museum. Phineas brings playwright Phillip Carlyle (Zac Efron) on board to help with promotion. When Phineas meets famed singer Jenny Lind (Rebecca Ferguson), he focuses all his time and energy on a tour for her. Leaving Phillip in charge, Phineas neglects the circus as protests mount against the circus. When his worlds start collapsing, Phineas must make a tough decision. Loosely based on the history of P.T. Barnum and his famed circus, The Greatest Showman is a fantastic, charming musical recounting the story. Hugh Jackman is superb as P.T. Barnum. He carries most of the film with his acting and singing. Showing he is more than just Wolverine, he revels in the role. Michelle Williams, as P.T.’s ever patient wife is also excellent, even if she has a much smaller role than Jackman. She wants what is best for her daughters and for her husband’s happiness, regardless of how crazy his ideas seem. Zac Efron, no stranger to musicals, has grown up since his High School Musical days. He has a flair for the genre and it shows how much he enjoys it. While he is a significant character, I wish he had been given even more to do. Of Barnum’s performers, all of which are excellent, Zendaya and Keala Settle are the standouts. Settle shines through her vocal performances. Ironically, as a trapeze artist, Zendaya gives a more grounded performance. Her story focuses on the romance between her and Efron’s character. It shows the reality of an interracial couple at the time. She and Efron have good chemistry on screen, making for a realistic coupling. 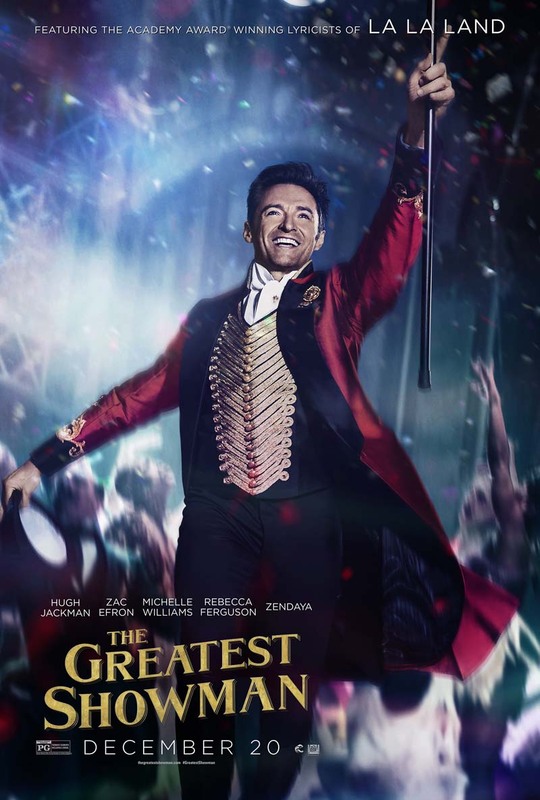 With the title The Greatest Showman, it seems fitting that it is a musical. It highlights the showmanship of Barnum and his crew. The songs and choreography are spot on, making for a highly entertaining film. Themes from the songs pop up often enough to remind you where P.T. and Charity started and grounds the characters. While I’m sure there was more than a little creative liberty taken with the story, I think the heart is there and it all melds together nicely. With a great cast, interesting story, and amazing musical numbers, The Greatest Showman definitely doesn’t disappoint. It feels longer than its short 1 hour 45 minute runtime, and I mean that in the best way. You become so mesmerized by the story that you don’t want it to end. Make sure to see it in the theater to truly appreciate it.